Appointments: Canada & Bermuda Territory Corps (July 1977), Training College (December 1979), Divisional Headquarters (June 1985), Corps (July 1988), Divisional Headquarters (June 2000), Divisional Commander (June 2001); New Zealand, Fiji and Tonga Territory Divisional Commander (February 2007); United Kingdom Territory with the Republic of Ireland Chief Secretary (June 2009); Canada and Bermuda Territory Territorial Commander (July 2011); International Headquarters International Secretary for the Americas and Caribbean (September 2014), Chief of the Staff (November 2015). Lt. Colonel Brian Venables: We have a good outline of your history with The Salvation Army, but we want to know a little bit about you. What excites you? What gets you up in the morning? What makes your day? Commissioner Brian Peddle: What gets me up in the morning? Sleep and rest are a necessity but engaging a new day comes easy. I wake with three thoughts…First, I hope the family is okay, then I hope the Army is okay and finally I hope the world is okay—and all before you make the first coffee—through a check on social media. As an international leader, I am keenly aware that while I am finishing my day, half the world is just beginning. The idea and thought that The Salvation Army is a 24/7 reality is quite intriguing. As never before, I am aware that the sun never sets on The Salvation Army flag. What excites me is the ongoing reality that people are engaged in mission, and the vibrant activity of the Army continues…the gospel is being preached, suffering humanity is being served, strategies are being planned, schools opening for children, a mobile clinic rolls into a needy community, or a meal is served. What gets me up in the morning is knowing that the Army has not been sleeping—it’s a living organism and I engage with it as soon as I wake. I find that quite inspiring. Do you hear lots of good stories? My inspiration comes from the good stories that arrive reminding me that the world is small and very interactive. I am privileged and daily I am aware of an Army that is using its spiritual footprint in the world to the fullest extent. I never cease to be amazed at what God is doing. There are also many days when I am concerned about, and praying for, some part of the Army world where there is conflict, or there is a natural disaster, or some of our people are at risk. We are serving in 128 countries and almost without exception, a news headline draws attention to the fact our people are there as well, sometimes serving in the midst of their own tragedy. That’s the volatility of the world that we live in. I think there is lots of room, not only to celebrate God’s faithfulness but also to pray through some of the challenges faced by people and the circumstances that surround them. What relationships do you value the most? I thank God every day for my growing relationship with him. I am simply aware of his presence and a journey that remains an adventure with the Almighty. I am presently understanding what it means to live in this world and still do so with an active consciousness of God’s presence. Family comes next. My wife, Rosalie has been a central focus for 40 years and for all of that time we have shared a ministry partnership that’s been incredibly rich. Of course, we are both preoccupied with the broader family and the interaction with two daughters, sons-in-laws and five grandchildren. Our day usually ends with FaceTime as they get home from school or are heading out to evening events. The best time of the day is when the screen comes alive and I hear the words: ‘Poppy, I have something to show you.’ We stay connected even though we are not together often. I might admit and put out there as a caution to all that sometimes life moves so fast that personal needs are challenging. We are very conscious about making time for others. How did you come to The Salvation Army? That was an interesting time in the life of my family. I credit my mom and dad, who were not Salvationists, but were a bit uncomfortable with things that were happening in their local church. In obedience to God they started to go to the Army and sometimes I would go along. Early in that experience they found a really good place in the Army where they were welcomed and embraced. Before I knew it, we were attending! I was immediately taken by the music, by vibrant preaching…I would even now remember the animated and enthusiastic preaching and strangely I remember testimonies. I was used to a very quiet, formal liturgical experience. I admit I was attracted, pulled in and warmly welcomed and embraced by corps officers and people who displayed God’s love and genuine interest in us. A month ago I had the privilege of going back to that corps, Trinity Bay South, in Canada to lead the 125th anniversary celebrations. All I can say is that God is faithful. So, there were other opportunities to be engaged besides family worship. Were you involved in the music sections or corps cadets, the discipleship program for teenagers? No, I’ve missed most of that by not showing up until I was 14–15 years of age. I had skipped some of these formative things that many of our Salvationists get to enjoy as kids growing up in the Army. Strangely that was never an issue. I soon became a soldier and without a lot of time in between was sensing a call to officership and not to be dismissive. The rest is history as I now get to lead this incredible Army that gave me space and a spiritual home as an uncertain teenager. What about your children? They have been part of junior soldiers and corps cadets. As an officer family we mostly remember two corps where our girls were nurtured and cared for by wonderful people who are still our friends today. They shared in all the programs which gave them the gift of music, contributed to their leadership capacity and helped develop their faith experience. It was wonderful and rewarding. One of my concerns is how we help our young people to be discipled in today’s world. I’m concerned, for instance, about those very good formative discipleship programs (junior soldiers and corps cadets) that my kids participated in and I am not sure they are equally available now. You can be certain you will hear me say more in the future about our children and youth. What will be your immediate focus as General-elect? What are your priorities? With the help of those around me I am already in transition mode. Apparently there are things coming my way that I have to do in advance of Aug. 3! It seems that already I’m engaged. It does help that I have worked closely with the present General and I am already a part of every dialogue and initiative. Any handover will be easy due to a very positive relationship with General Cox. The other huge question you ask: what will be my priorities as General? There are agenda items that have been a part of us for the past few years—the Accountability Movement, the focus on child protection, the governance dialogue, with a focus on better systems and infrastructure. We have done that while still taking on the responsibility of winning the world for Jesus and growing the kingdom. General Cox has enabled the Army to implement many important initiatives and I will continue to embed these things but I don’t think they will require as much of my attention. So, my sense of priority would be to redirect some of those resources that are no longer required to make sure we reinvest those energies in our unique mission focus, engagement with our officers and soldiers while articulating as clearly as possible God’s present call upon the Army. The Army must again live up to its call to be a mission-focused Army. What I mean by that is every soldier, every officer, all of us together accepting our responsibility to be a valued army in the world in which we live. This means that the two significant aspects of our mission statement—preaching the gospel unashamedly and serving suffering humanity—need to remain connected. I am anxious to share more and in time that will come. I am deeply aware that I need to be the 21st General for the 21st century…by God’s grace and with the prayers and support of his people. At this preliminary stage, what is your vision for the Army beyond August 2018? We stand on the shoulders of many good people and we honor them. They worked with the issues of their day to build a great and much respected Army but we have to grapple with the issues that are confronting the Army in our day. We cannot be unclear or ambiguous about things that are of concern to our people around the world, yet we must do that within a diverse reality. We need to remember that while we are an international Christian movement we cross many cultural boundaries and we need to understand and respect the cultural context. We live in a rapidly changing world and Salvationists need to be safe in their belief structure and faithful but not disconnected. All of these things could appear to be in conflict, so as General, for the next five years, I intend to lead One Army, and keep that One Army intricately connected and focused while we honor and deal with the diversity that’s all around. That will be a particular challenge, and to do it in a way in which the movement continues to impact the world in which we live. As the General-elect of The Salvation Army, what relationships both internal and external do you want to grow, enrich or build upon? I will leverage on the diversity we have around the world. We have 59 territories and commands and three regions. I have not forgotten the Boundless Congress where, despite our many differences and the breadth of our diversity, our worship, our doctrine, our sense of mission brought us together as an Army family. Across this diverse spectrum we are linked and we celebrate. There are committed leaders who care for the Army daily and have been given responsibility to lead the Army in their part of the world. They are an extension of the General’s office and that relationship is very sacred. I want a responsibility to both honor and lead my leaders. My primary concern will be to have a positive consultative relationship with my leaders. I indicated to the High Council that if elected I would take on this role because I’m available to serve and, by God’s grace, I would do that with the partnerships and strengths in that room. I don’t directly lead the Army in Indonesia or Japan. Somebody else does that. But we want to do it together, so that relationship is critical. Beyond that we have any number of relationships that are important to us. For instance, the ISJC [International Social Justice Commission] helps us to find ourselves at various tables and sitting in partnership with groups and organizations. 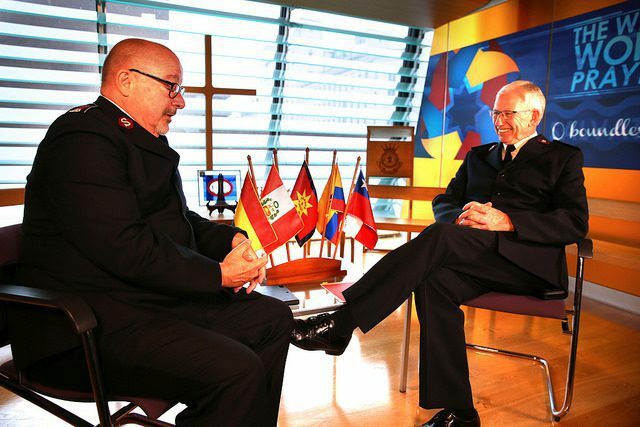 Salvationists should watch carefully as agendas on the world scene develop and know we are engaged. There are constant appeals to the Army to put our name on any kind of manifesto, so we look at those and we say: ‘Is that a partnership we want to have; is that where we need to leverage?’ I think some attention to those kinds of things needs to continue and then on a more local level be encouraged. Partnerships are important to us. We cannot make an impact in the world on our own. So, the question is with whom do we need to partner to do the best that the Army can do in different parts of the world today, that will not compromise who we are or mean we abdicate our mission responsibility. Who has influenced you in preparing for this role? 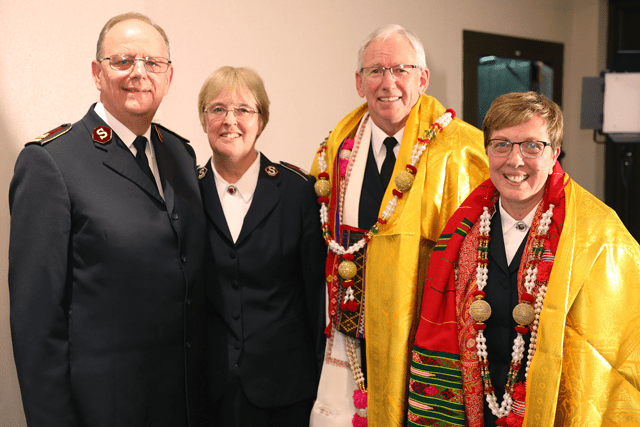 The emphasis is not so much on ‘who’ as ‘what’ has prepared me, and that is the Salvation Army appointments I have had and the myriad people who’ve been a part of that journey. I look at my life as having been written in chapters. These chapters are appointments that have been ours. They’ve taken us from one responsibility to the next, and God has led and prepared us along the way. Each appointment has been: ‘Are you sure?’ And we’ve moved on to that appointment and been stretched and challenged. In all of those appointments, people have been there. They’ve been part of teams, they’ve been part of corps and on our staff. Without taking the risk of saying who and when, there has been a collection of people who helped shape us, who have encouraged us and who’ve gifted themselves to us. So, we’ve grown in our capacity and skills over the years—because it’s been 41 years of ‘school’ that has yet to finish! In all those appointments you found a sufficiency of grace and wisdom? Absolutely. I think that’s a given—I don’t exist outside of what God does. I take refuge in God’s promise: So do not fear, for I am with you; do not be dismayed, for I am your God. I will strengthen you and help you; I will uphold you with my righteous right hand (Is. 41:10). I step into the role of General with that in mind—do not be afraid, do not be dismayed. I will uphold you by my righteous right hand. Even as the Chief of the Staff people have asked me: ‘How do you sleep at night?’ Well, I confess to anybody who’s prepared to listen that I rest in the shadow of the Almighty. God is sovereign. If I do my part and do it as best I can, then I have all of the resources of Heaven that will just hold everything together—and I can go to bed and go to sleep. Have you considered what strategies you could employ to stay connected to The Salvation Army family? So far we have traveled to 30-plus countries in the world. Rosalie and I already have a huge heart that wants to embrace the Army. We’ll do that in a manner in which we only know how—that’s relationally. It’s our sense that the Army actually is embracing us. I went through a lot of my years as a territorial commander or a divisional commander saying: ‘Lord, don’t let me leave obvious handprints on the Army that are Brian Peddleʼs.’ In the past years the Army has actually been leaving handprints on me. Our interaction with the Army, our people, their sacrificial service and their sense of mission has changed us. So we look forward to connecting with people around the world—as we spend time with them—we identify with who they are, what’s important to them and how they want to be a part of the Army. So, embracing the Army with its diversity—nations, peoples, languages, cultures, worship—will be one of our greatest joys. I believe God celebrates it and obviously he blesses it with his hand day by day. I’ll find refuge in that as we move forward. 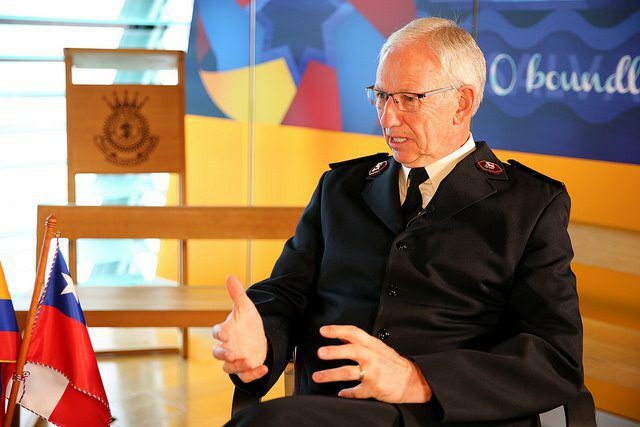 As General-elect, what is your view of the current state of affairs in The Salvation Army? ‘State of affairs’? That could take a while! I look to the Army—and confess my knowledge of it is substantial—and I see it, warts and all. We are not perfect nor do we have everything right but you would have to a very pessimistic person to not see what God is doing. Being the Chief of the Staff for the past three years, my sense is that the Army is well and it has the ability to move forward and continue to discover and claim our place in the world. We have a number of unifying agenda items that we need to work on and though they will be difficult it will be for the good of the cause. We are strengthening a number of support mechanisms—finance and information technology platforms. These improved structures will enable us to do the things that come into view after that. Financially, the Army is being well managed and we celebrate that while trying to figure out how we support the international Army in places where resources are not plentiful. That remains a challenge. I think the continuation of all of these will be important. The Army faces a bittersweet reality in the area of growth and advancement. We have to call for more soldiers, more candidates. In 10 years, I want the Army to be a spiritually vibrant, resourced for mission, fit for purpose Army. I want Salvationists to believe that God is doing a new thing among us. I refuse to limit God or consider for even a moment that our best days are behind us. What I would like to see is every junior soldier, every soldier, every officer engaged in the mission of the Army—winning souls, caring for suffering humanity and knowing that the kingdom of God is growing. Would you say that’s the emerging challenge—making sure everyone has a mission? If there is no mission we’ll get confused. If there is no mission we won’t be engaged. If there is no mission there is no calling. If there is no mission, why the gospel? If there’s no mission, there’s no Army. I think General André Cox has been quoted as saying the world doesn’t need another army that’s confined to barracks. We need people who are willing to do business with neighbors, family members, acquaintances and strangers and talk to them about the love of Christ and that he can change their lives. Our sense of mission will sustain us even if other things become a little blurred. How can The Salvation Army support the General? To me that’s obvious. The prayers of God’s people will be the refuge that I will rely upon. Let’s be clear, the General needs prayer! Thus far in my life I’ve created circles of prayer around us and would continue to do that. 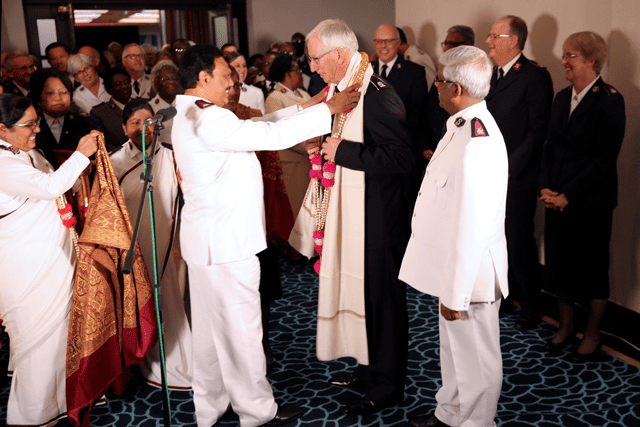 What I like and I’m intrigued about at the moment is the fact that hundreds of thousands of Salvationists will find the small place in their prayer list to pray for their General. This is one General who will readily say I need those prayers. Additionally the wisdom of Solomon, the strategic approach of Joshua, the courage of Peter are all needed. 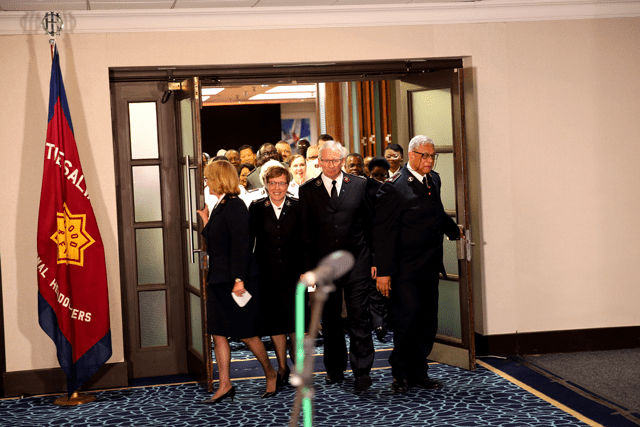 Salvationists around the world can pray daily for the well-being of the General, the agenda that’s in front of him, and all that will be required—courageous leadership and so on—to make sure that we’re not managing the Army but leading the Army. You’ve been at the High Council. I’m sure there are some highlights of that you would like to share with the people. The High Council is a very unique gathering with a singular purpose. We take all our commissioners and all our colonels who are territorial commanders or territorial presidents of women’s ministries, and we come together. In 2018 we certified that there were 108 people in attendance. It was amazing. I believe Salvationists can give thanks for a spiritual exercise that enables the election of a new General when needed. It’s a gruelling process that has its own life for the time that we are together. We’re only called together for the sole purpose of electing a new General, and as soon as that’s been accomplished we disband, we dissolve. What’s unique about that over the days is that there is everything from heavy debate, not always in agreement on every point, but heavy debate respectfully carried out, to moments when you know that God is speaking. The holy hush, if you like, comes and you can recognize those times and if I had the liberty I would tell you about those very significant moments. The intricacies of being nominated, being declared a candidate and then having to respond to the High Council and the many questions they prepare is quite an experience. It’s probably one of the hardest things I have had to do in a while, yet there is immense privilege in doing it with an incredible measure of personal conviction. I could have said many things but it was important, in that moment, to speak from the heart. I had to say what my personal convictions were. What is absolutely amazing about the process is that every appointment an officer receives in a lifetime will normally come from somebody who is in authority over them. That’s how the appointment system works. The office of the General doesn’t work that way. You’re actually elected by your peers. I have no difficulty with being appointed to the position of the General, but it took 108 people to make that happen and this comes with God’s blessing and anointing. One of the prayers we had during the High Council—and it came out often—was, help us to identify whom God has already decided, who he has already anointed, and in a moment of time I accepted identification in that way, I accept that anointing and it’s only on that basis then that I can come out of a High Council and be presented as the General-elect. A fascinating process, quite intriguing, deeply spiritual, but tremendously meaningful for the Army for the next five years. And now I’m a part of that. That’s awesome.